At age 86, he’s still signing! ﻿ Pitcher Ed Erautt proved one of my basic beliefs about baseball. Sometimes, the game isn’t about a hit, play or even pitch. Sometimes, baseball is all about a feeling. On May 29, 1949, Erautt spun a four-hitter against the Cubs. What memory stays with him? Thanks to http://www.retrosheet.org/, the day lives on. Although August 5 of that same season didn’t produce a win or save, Erautt struck out six Brooklyn Dodgers in a four-inning HITLESS relief stint. What K was most satisfying? Erautt’s father played semi-pro ball in Saskatchewan. He trained his two boys as batterymates. 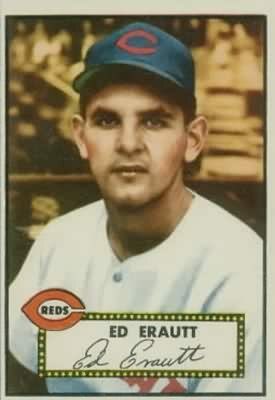 Brother Joe Erautt (born in Canada three years before Ed) wound up as a cup-of-coffee catcher with the White Sox in 1950-51. How could two boys avoid the lure of hockey, that call from north of the border? Although this feature interview from accomplished Pacific Coast League historian Bill Swank is 15 years old, it’s a great look at the years Erautt spent in the high minors. Tomorrow: What did pitcher Ron Negray pitch after baseball?